In line with Apple's confirmation earlier this week that online sales of the iPad 2 would begin at 1:00 AM Friday in each of 25 new countries, the device has already gone on sale in New Zealand and Australia. 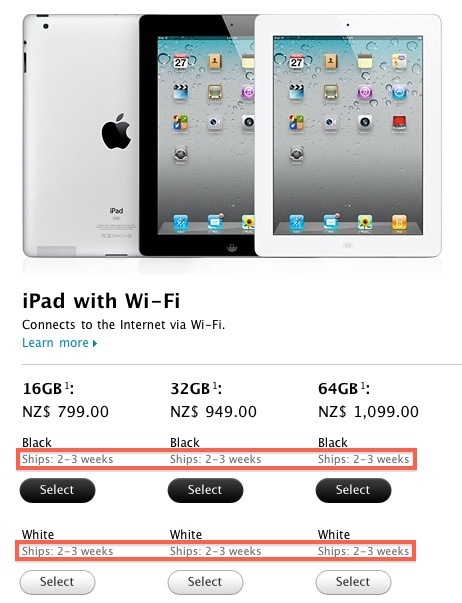 As may have been expected given current shortages in the United States, new iPad 2 orders in New Zealand and Australia are not shipping immediately but instead come with shipping estimates of 2-3 weeks. Apple could certainly ship units earlier than the stated timeframe, but the company clearly does not want to promise that units will be moving out for distribution immediately. Apple does typically maintain separate distribution chains for its North American, European, and Asian markets that sometimes result in differences in shipping estimates among countries, so it will be interesting to see the status of deliveries in European countries once sales begin in those countries. Shipping estimates for new online orders in the U.S. remain at 4-5 weeks.